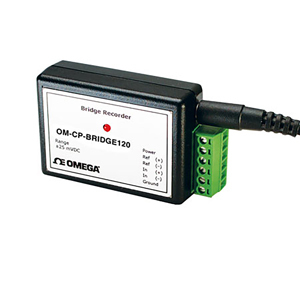 The OM-CP-BRIDGE120 Series are battery-powered, stand-alone data loggers that measure and record voltage signals from strain gages, load cells and other low level dc sources. These compact units are perfect for monitoring stress, torque, strain, pressure and data from many other sensors/transducers. OM-CP-BRIDGE120 Series data loggers are available in ranges from ±10 to ±1000 mV, and are capable of storing up to 32,767 readings, and up to 20 readings/sec. The OM-CP-BRIDGE units feature non-volatile solid-state memory, and can store readings even when the battery is discharged. Data retrieval is quick and easy – simply plug into an available USB port. The OM-CP-IFC software displays your data in an easy to use graph, so you can analyze your data quickly. A variety of powerful tools allow you to examine, export and print professional looking data with just a click of the mouse. 注: Comes complete with terminal block connector, and 3.6V lithium battery. Operator’s manual and interface cable are included with the OM-CP-IFC200 software (required for data logger operation and sold separately).